This has been a very wet month. The plants from cloud forests, such as Masdevallia, Pescatorea and Bulbophyllum, have shown their appreciation by exploding with new growth and flowers. 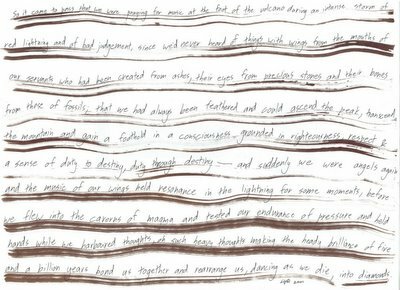 February is usually a rather quiet time of year, but I have a number of special things to share with you. Burrageara Stefan Isler. 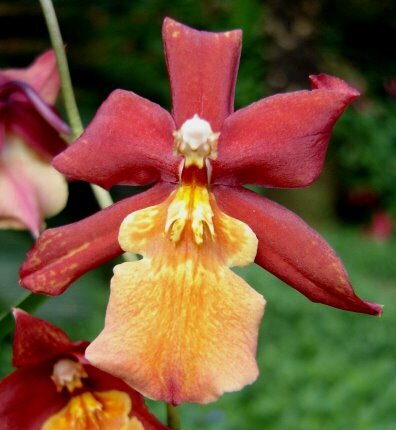 An intergeneric hybrid in the Oncidinae (Cochlioda x Miltonia x Odontoglossum x Oncidium). This initially produced two spikes, but a thunderstorm left me with one flowerspike of 5 flowers. Stefan Isler is an old hybrid really, and its only redeeming feature in the 21st century is the intensity of its coloration: the flowers are smallish compared to modern hybrids and have very poor shape, the curving petals reducing the overall size almost by half. Cymbidium Summer Pearl 'Senna'. 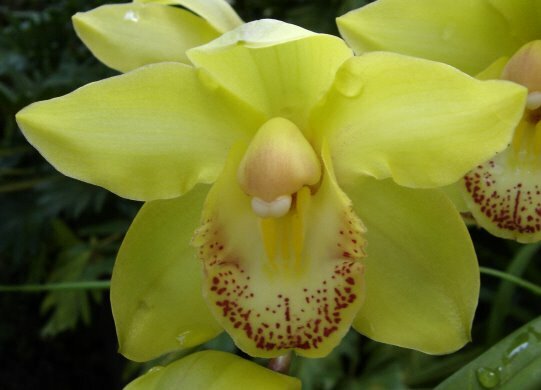 A miniature cymbidium with pale green blooms of full shape. This grex is unusual for its capacity for summer flowering, a time rarely graced by cymbidiums. The individual in the photo produced 7 flowers on one spike (which snapped soon after, when raindrops collecting on the flowers increased the weight of the whole thing beyond the capabilities of the spike). 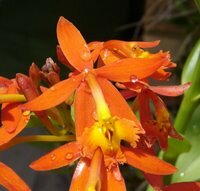 Epidendrum radicans. People always confuse this reedstem with Epi. ibaguense, which looks very similar. However, radicans has resupinate flowers (i.e. lip lowermost) and a (quite annoying) scrambling habit with aerial roots produced along almost the whole length of the cane. The particular individual pictured here has interconnected stems in three separate containers, a jumble of keikis and roots. Forget Gordian's knot, try repotting one of these. 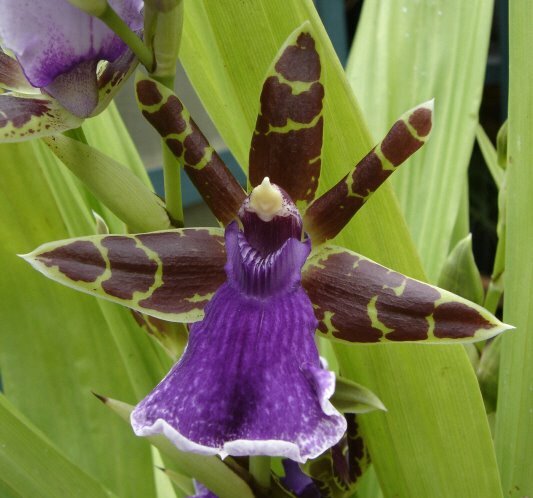 Zygopetalum Everspring 'Hollandia'. With 29 flowers on five flowerspikes, this is definitely the star orchid of the month. I finally cracked the secret to growing this very leafy orchid when I moved it from its previous aspect under shade net outdoors and placed it on the highest shelf in the greenhouse. Here it received incredibly bright light short of burning, constantly moving air from a fan and a regular watering regime, resulting in vigorous growth and flower production. 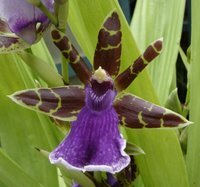 This hybrid has incredibly intense colours: dark brown barring on fresh green petals and sepals, and a violet-blue lip with pure white background. Although photos often lie, the colours here are pretty accurate. Spidery and sinister, a Gothic romance, this is my kind of orchid. Burrageara Nelly Isler. One of the progeny of Burr. Stefan Isler, this is superior in every way, bearing larger and more rounded flowers with more intricate, hideously kitschy patterning. The combination of bright orange spots with a delicate coral pink background are particularly nauseating. The tiny plant in my collection produced three spikes with a total of 9 flowers, almost completely obscuring the foliage. The blooms are nice and flat, not so recurved as in Stefan Isler. 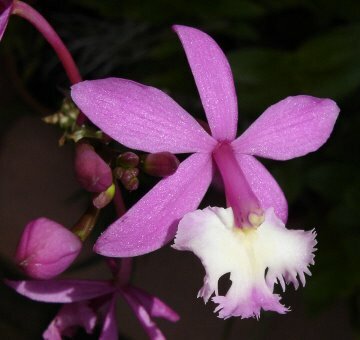 Epicattleya Nebo. Bright pink starry flowers are produced in profusion on this compact reedstem. Any cattleya influence is virtually drowned out by the influence of the epidendrum parents, apart from the crenellated labellum and slightly larger size of the flowers than other reedstem epis. Next month: expect images of several Thai-bred hardcane dendrobiums, Epidendrum ciliare and some of the weirder things in my collection. I've been trying to put up the latest In The Greenhouse post, but the net settings at the lab (which is where I abuse the facilities to provide you all with these aimless ramblings) have been altered, preventing me from uploading any images. That's a long opening sentence. Anyhow, I'll just keep trying; i actually have enough images for two postings by now. 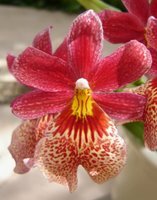 Would love to share my photographs of Dendrobium bigibbum var compactum and Gongora galeata, as well as some vivid Burrageara hybrids. All I wanted was to add some beauty to the world.